Our new Super Bagger mowers are our most effective bagging models ever, and make it easier to maintain your lawn to your personal level of perfection. 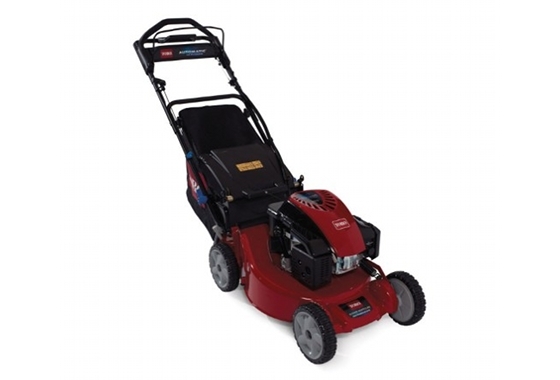 AutoMatic Drive System: This self propulsion system innovatively matches your step and pace, allowing you to mow effortlessly up to 4 mph (6.4 km/h). Superior Bagging System: The cast aluminium deck and the large rear-discharge opening forces more grass into the bag, so you empty the bag less often. And the EZ Lift Bag makes bagging easier than ever – simply lift the bag on or off with one hand. Cast Aluminium Cutting Deck: Durable, rust-free cast aluminium cutting deck converts from mulching, side discharging, or rear bagging without tools. EZ Lift Bag: EZ Lift Bag makes bagging easier than ever; simply lift the bag on or off with one hand. Less effort, less time. Quick Stow Storage Handle: Tap the Quick Stow lever with your foot to raise the handle for easy storage. Super Recycler Cutting System: The patented Super Recycler cutting system features a veneered cutting blade, clipping accelerator and kickers that combine to give you the best cutting system Toro has to offer. 5-Year Guaranteed-to-Start: Starts in two pulls for five years.